The Iowa Barnstormers dropped a 61-43 decision to the Chicago Rush before a record crowd of 12,184 at Wellmark Field in Des Moines, IA on Friday night. 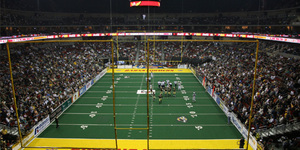 The game marked the return of the Arena Football League, after a one-year hiatus. With the victory, Chicago improves to 1-0 on the season, while Iowa falls to 0-1. Chicago jumped out to a quick 7-0 lead after DB DeJuan Alfonzo intercepted a pass thrown by Barnstormers QB Brian Villanueva and returned it for the game’s first score. The Rush never looked back , as the team rallied behind the play of veteran QB Russ Michna, who threw for 6 touchdown passes in the contest. In contrast, the Barnstormers continued to struggle offensively, turning the ball over 6 times. After falling behind 17-0, Iowa Head Coach John Gregory replaced Villanueva with newcomer Ryan Vena, who got the ‘Stormers within 10 at one point, but that would be as close as Iowa would ever g et. Next up for the Barnstormers is a much needed week off, followed by a road contest in Milwaukee on \riday, April 16th. Iowa returns home to face the Oklahoma City Yard Dawgz on Saturday, April 24th. For upcoming promotions and ticket specials or to order your tickets call the Barnstormers at 515.633.2255 or log on to www.theiowabarnstormers.com.